"We're not swaying voters; this is just our way of rallying up our supporters and rewarding them for showing their support for the governor," said Garcia. Other prizes include, to name a few: a cowboy roping lesson with Lieutenant Gov. David Dewhurst, lunch with 19-time PGA tour winner Ben Crenshaw, a shooting lesson at LaRue Tactical, a high-end rifle manufacturing facility in Leander, TX, and a 30-minute business pitch to Red McCombs, former owner of the San Antonio Spurs. Prize winners will begin to be announced on October 16, just two days before Texas early voting begins, said Garcia. The raffle officially launched August 1 and will run through October 18. More prizes may be added to the raffle before the October deadline, said Garcia. Why would I want to bid on having lunch with a "TurdBlossom"? OMG – and the winnder will THROW UP the entire meal. 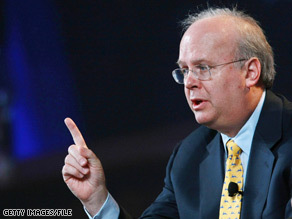 Who is the HECK wants to have lunch with KARL ROVE????? Man I'd sure hate to win that as a prize. And second prize? *Two* lunches with Rove! What's for lunch? Baloney or crow? I wouldn't have lunch with Rove if he paid the tab at a high end restaurant. I watched this moron on a network news program one Sunday morning a couple of months ago. All he did was grin that insane grin while fidgeting in his seat, while out-talking the other guest on the show. He literally would not let the Democrat get a work in edgewise. Nor could the moderator get a word in. What a rude, disgusting, nauseating man he is. A meal with him? No, I'd rather eat with a pig in a barnyard. I'm afraid if I won that prize I would lose my lunch before the meal was completed.